The leading automotive nations, China, the USA, Japan, Germany and France are shown in figures 1 and 2 (data source: FKA, NEA and Efahrer) with regard to their e-mobility markets. As seen below, the figures show the number of new BEV and PHEV registrations (figure 1) as well as the share of BEV and PHEV in all new registrations (figure 2) from 2015 to 2018. China’s strong growth since 2015 is impressive, while new registrations in all five markets rose particularly in 2017 and 2018. The Chinese account for more than 50 percent of all new registrations of electric cars worldwide. In the case of electric buses, even 99 percent of all models sold since 2011 are in China (source: BNEF). It can be seen that in all five countries the share of e-cars in new registrations has risen continuously with already over two percent in 2018 in all countries except of Japan (source: BNEF). China is also ahead in terms of charging stations. In 2017, for example, around 214,000 public and 232,000 private charging stations were in operation, while the construction of a further 100,000 public and 500,000 private charging stations is planned (source: NEA). But the UK is also providing new impetus for e-mobility on the island with its “Road-to-Zero” strategy. The number of vehicles with combustion engines is expected to fall sharply from 2030. After 2040, no combustion engines should be registered at all. Extensive subsidy programs should also make the British strategy feasible (source: gov.uk). In order to actually outstrip the combustion engine, battery production is of great importance in addition to the pure vehicle manufacturing industry. A large proportion of the value of electric vehicles, around 40 %, is generated by battery production (source: Finanzen.net). 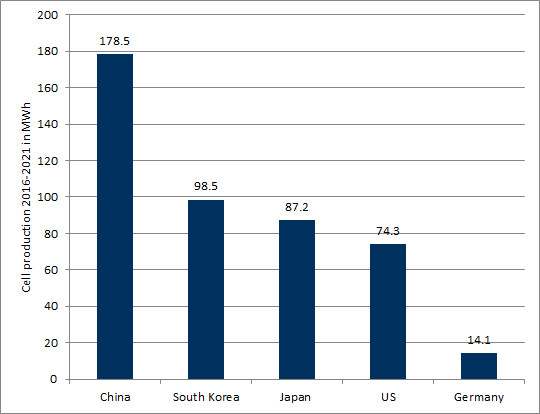 Here the Asian countries and their battery manufacturers are by far in the lead. 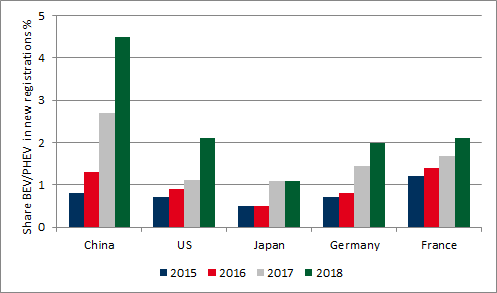 Figure 3 shows domestic cell production in the five leading countries from 2016 to 2021 (FKA estimate) in MWh (source: FKA). Domestic battery cell production in the three Asian countries, China, South Korea and Japan covers about 80 percent of the market. The industry giants LG Chem (South Korea), CATL (China), Panasonic (Japan) and Samsung (South Korea) have also set up a number of cell production facilities in Europe and the US. For example, LG Chem has built Europe’s largest battery factory to date in Poland, while the Chinese manufacturer CATL plans to invest a three-digit million sum in 2019 for a cell factory in Thuringia. Lithium-ion batteries are used for the majority of electric vehicles. Accordingly, the demand for cells, as well as for raw materials for battery cells, has multiplied in recent years. This demand will again increase strongly until 2030. With increased demand, the price will also rise in most cases (Figure 4). For example, the price of cobalt rose from a level of around $30,000/tonne in the years before 2017 to over $90,000/tonne in the spring of 2018. 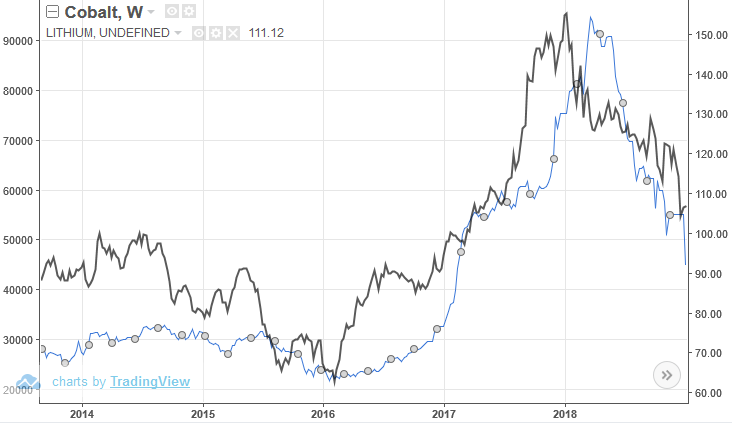 In particular due to the trade dispute between the USA and China, the prices of both lithium and cobalt fell again during 2018. You can also find an assessment of the availability and developments of lithium in our article here. In conclusion, it can be said that the manufacturing cost of electric vehicles is heavily dependent on international raw material markets. Electromobility is gaining momentum worldwide, also in Germany. This is due to falling costs for batteries and thus vehicles, as well as governmental incentive programs. However, access to charging points, as well as the tariff structure for charging processes, is very complex and inconsistent in many cases. E-mobilists are still severely disadvantaged compared to other vehicle owners. For the energy industry, the charging point is the outcome of new and still untapped business models. So far, however, investments have been made here rather than profits. However, in order to be prepared for a market ramp-up, these investments are necessary, even if they are not expected to pay off until the next decade. In an international comparison of battery production, Germany is not yet completely out of the race, while German carmakers have so far tended to lag behind. Asian countries, especially China, are large sales markets and producers of vehicles thanks to strong government support. The production of battery cells is also primarily in Asian hands. A market ramp-up of e-mobility in Germany would increase the demand for electricity by up to ten percent. The peak load problem in some distribution networks can be solved at least in part by suitable business models. If targets for reducing CO2 emissions are to be met, this must be done particularly in the transport sector. The Environmental Committee of the EU Parliament, as well as the EU Environmental Ministers, would like to tighten up the exhaust emission requirements for passenger cars accordingly (source: EU Parliament). By 2030, passenger cars should now emit 35 percent less CO2 than in 2021. The threshold for 2021 is 95 gCO2/km, the permissible emission value in 2030 would, according to the resolutions, be only 62 gCO2/km. Currently, newly registered passenger cars in Germany still emit an average of just over 132 gCO2/km, twice the value permitted in 2030 (source: Deutschlandfunk). Lower fleet values would give e-mobility a boost. 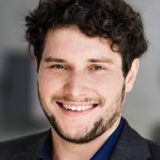 Whether business model development in e-mobility, developments on the European electricity markets or the impact of current or future electricity prices and their structure on e-mobility. 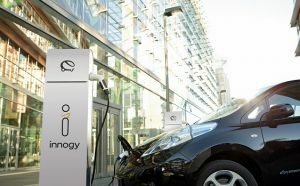 This is only a selection of topics that players in the energy, residential and automotive industries, as well as politicians, will have to face if Germany wants to become a pioneer of e-mobility. Energy Brainpool supports this by imparting knowledge in the seminar “Electricity Market Knowledge for E-Mobility” as well as by targeted workshops in the field of business model development. We look forward to accompanying you on this exciting path.